The Horseless Age. Horseless carriages and early automobiles and cars from the late 1800's to the early 1900's. Electric Car Society. Early cars. Early augomobile. Historic cars. Historic Vehicles. Historic vehicle. Historic car. Historic Cars. Early car. Not only was The Horseless Age the first automotive magazine, but it was also the most respected automotive magazine and was supported by the upper crust of American society. The earliest issues had only 800 copies per month printed and only a few such copies remaiin. Nevertheless, the vast majority of information that we have today regarding the earliest automobiles, comes from these magazines. Reading issues of this magazine is absolutly fascinating. For example, different issues describes the first manned aircraft flight (May 17, 1899 by A. M. Herring), shows the first advertisment by Henry Ford (a classified ad for a new type of truck), and virtually every early car every built. Also interestingly, the magazine covers a large number of propolsion systems such as compressed air, electric cars, hybrid cars, steam power, deisel power and various types of flywheels and other contraptions. It is interesting to note that there were more electric cars (perhaps pushed by the electric power industry) then gasoline powered cars, till 1911. We offer reprints, on cd-rom, of these rare editions for a nominal fee. Below is a sample of just one issue from late 1895. On the cd, you can click on the thumbnail images and the image is enlarged. The quality of the reproductions is readable to good, and is in black and white. Because of the age and rarity and in some cases, unavailability of certain issues, the quality of the pages may be only acceptable. Were the Wright Brothers the wrong brothers? Was A.M. Herring the first to fly in 1899 - four years before the Wright Brothers? For 100 years, most people have assumed that the Wright Brothers were the first people to build and fly the first manned, heavier then air, plane. 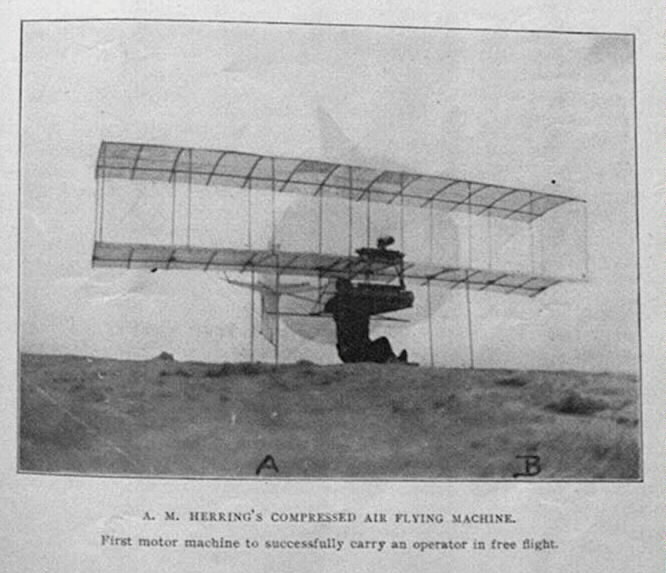 A recent investigation of early publications, however, seems to indicate that A. M. Herring made the first manned powered flight in 1899, four years before the famous Wright Brothers flight at Kitty Hawk. According to the May 17, 1899 issue of the Horsless Age, A. M. Herring was well known in the fiield of aviation and is a designer of lightweight aircraft engines and is also a bicycle designer. Further, it is clear from the published photograph of A.M. Herrings 1899 aircraft that the Wright Brothers plane looks almost the same. Interestingly, the Herring plane seems to have controls that the Wright Brothers adapted 4 years later on their first plane. Further the May 17, 1899 issue of this magazine also refers to the May 1897 issue (which sadly is not available to this author) which appearently also discusses A. M. Herring's aircraft inovations. Since the Horseless Age was the leading authority on automobive and personal transportation news, it is possible that the Wright Brothers read about A. M. Herrings invention. The May 17, 1899 issue of The Horseless Age describes A. M. Herring's airplane and states that he is the first man to fly. The magazine was of a high standard and the article should be considered credible. The June 7, 1899 issue of "The Horseless Age" discussess A.M. Herrings new lightweight gasoline engines. Notice that the design of the propellers. The Horseless Age magazine was the first automotive magazine in the United States and was supported by the upper crust of American Society. The magazine was very expensive for the time and provided the latest information and inovations to automobile owners and automobile manufacturers. Today, very few issues of the Horsless Age remain, however almost all of our knowledge on early automobiles comes from this magazine. Copies of this magazine are available in a handfull of libraries in the United States including the Detroit public library, the Library of Congress and perhaps others. Information contained in this magazine must be considered very credible. It is interesting to note that contrary to today's belief, most people at the turn of the century fully beleived that manned aircraft would be produced in a matter of time. The magazine, while specialing in "horseless caraiges" (automobiles), did periodically report about new inovations in aviation and light weight motor technology. "A.M. Herrings compressed air flying machine. First motor machine to successfully carry an operator in free flight"
Automobiles from the early 1900's. Cars from the early 1900's. Self propelled cars from the turn of the centurly. Antique automobiles. Automobile manuals. Automobile liturature. The first airplanes. Complressed air automobiles. Horesless carrages. Horseless cairage. Vehicles in the late 1800's. Early automobile magazines. English, German, French, British, American, Canadian, Italian, Japan, Japanese, Russian, Korean, automobiles, cars, vehicles, transportation, trucks, lorries, lorry, self proppelled devices. Parts, specifications.